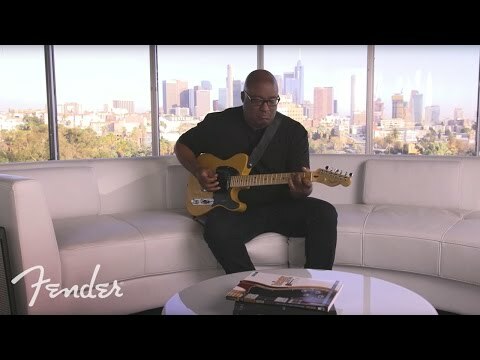 Known as the most successful solidbody electric guitar of its time, the Fender Telecaster is back with plenty of new and innovative appointments. Originally based on a simple design, it has since worked wonders to improve the lives of musicians all over the world. Now, the 2017 American Professional Telecaster uses the finest qualities of a historic Tele with upgraded features to bring this version right into the present day. Ash is the tonewood of choice for the body of the American Professional Tele, contributing to the quintessential Tele tone while offering a comfortable playing feel. The body has a gloss polyurethane finish to protect the paintwork on top of the natural grain of the wood. A smooth 25.5 inch scale length maple neck has been securely fitted to the body and is shaped to a new, Modern "Deep C" profile. The back has a satin urethane finish for an enhanced, effortless feel. Aboard the neck is a 9.5 inch radius sumptuous rosewood fingerboard offering you 22 narrow-tall frets with adequate space for performing string bends and experimenting with complex chord structures. Black dot inlays decorate the frets to guide you along, making each transition feel effortless. Fender have selected two V-Mod Single-Coil Telecaster pickups in the neck and bridge positions which produce a dynamic sound across the frequencies. The single-coil sound is what we all know and love from a Telecaster, that bright twangy tone is unmistakable. The slanted bridge pickup adds more treble and has a higher gain output, working beautifully with the guitar's solid alder body. This single-coil pairing is powered by alnico magnets that produce a wide range of different tones suitable for many different genres including blues, rock, country and jazz. The Telecaster has a Master Volume control with Treble-Bleed circuitry, designed to let the guitar's true sound come to life. A Master Tone control and a 3-position blade pickup switch make tweaking your sound very straightforward. A 3-saddle strings-through-body Tele bridge with compensated brass saddles with a removable modern "Ashtray" style bridge cover is fitted to the lower bout of the body. The nickel/chrome hardware plus a protective pickguard complements the style and beauty of the American Professional Telecaster. The Tele headstock is fitted with dependable Fender standard cast/sealed staggered tuning machines which work tirelessly in conjunction with the bone nut and bridge to maintain tuning integrity with precision. To keep the guitar looking and sounding as good as new, Fender supply an Elite molded case, ideal for transporting or storing your new pride and joy away when it is not in use. Posted on 12/04/2018 by Jessica Classic Tele tone, perfectly set up out of the box and plays like butter. Could not be happier. This is a very high quality instrument for a working musician (or a bedroom enthusiast with plenty of money!) Worth every penny. Also extremely happy with Dawson's prompt and efficient service, as always.